I hope this won't hurt your feelings, but I have to tell you that I don't think you are being quite fair in what you give us versus what we give you. We give you a map of our web site pages. We include the last modified date and an indication of the relative importance of each page. As we both know, that's helpful to you, especially if we are conscientious about the details. I am conscientious, and I feel like I give you more than you give me. To be fair, your competition (Microsoft and Yahoo) are even worse. But you could do much, much better. Let's take a look at what you do and where you go wrong. Oh, my. Right out of the gate you've put a bad taste in my mouth: you've listed aplawrence.com and www.aplawrence.com as different sites. Of course I deleted the "www", but it simply astounds me that you brought it up for consideration. First, there is a rewrite and 301 redirect: you can't even get to "www.aplawrence.com"! Moreover, I told you in "Settings" (see below) that you should always use "aplawrence.com" and NOT "www.aplawrence.com", but that didn't matter, did it? You've been confused in other places by non-existent sub-domains: your search tools used to give erroneous "ftp.aplawrence.com" results (even though THAT gets rewritten to just "aplawrence.com" too!). Sure, sub-domains can be confusing. So give us a way to tell you flat out which ones we use and which ones we do not! Let's start right at the top with the sitemap itself. You do tell us if we've screwed up an entry (I've done that now and then) and you tell us how many of the pages are indexed. But you don't tell us which pages are NOT indexed. Obviously you know what those pages are and could easily give us a listing, but you don't. Wouldn't that be advantageous to both of us? Right now you show that over 2,000 of the pages I submitted are NOT in your index. I'd like to help you and myself out by either improving those pages so that they could be indexed or removed from the sitemap entirely if that makes more sense. I have no real complaints here, but you could do a better job job of explaining the effect of disallowing your user-agents. I only recently realized that I should let Mediapartners-Google have any access it wants. But that brings up another issue. As we saw in Sitemaps, you tell us how many pages got indexed. What about the Mediapartners-Google index? How many of THOSE exist? We hope and assume that it at least matches the search index, but if it didn't, I'd want to know, wouldn't I? I see you have created some of these "Sitelinks" and have offered me the opportunity to block those I don't like. That's great, but I don't have a clue why you chose what you chose. I know from Analytics that there are more popular pages than those you chose, but you have your own ways of seeing things, so I'll play along. Tell me this, though: I blocked a silly link. Apparently it will only stay blocked for a few months? What's up with that? Do I really need to keep re-blocking? This would obviously be useful if I changed my domain name, though I do have to wonder why a 301 redirect isn't good enough. But if this is helpful, where's the assistance for moving off part of a site? Suppose I wanted to put all my MacOSX articles in a new domain? Again, I'd 301 them, but the very existence of this section suggests that you might need more than that to understand what really happened. If so, this section needs more. We'll see below that at least part of this is apparently useless, but if it did really work as advertised, there's nothing wrong in this part. Gosh, this looks just like Google Analytics, doesn't it? Top queries, Top pages, percent change - very good (though it would be nice if we could see more than a month back). This is good, but I'd love to see it done like Search Queries - a graph showing change over time and a percentage showing gains and losses. As I am one of those foolish people who rely on real, organic links, I don't know when links to my pages are created or destroyed. I can download your lists, and cobble up reports myself, but it would be nice to have it here. Really: "it's" is a keyword?? Wouldn't it be nice if this had a tab for broken internal links? I'll answer my own question: yes, it would. It would also be nice if it indicated unbroken but 301 redirected links. As it is, the only use I've made of this page is to search for links to pages I have redirected. Save me some time: list those automatically. I'm not sure what the point of this is. It's a subset of Feedburner stats, so why have it here? Or if you do want it here, why not give ALL Feedburner info rather than just Google tool users? As you point out at Subscriber Stats Help, this is inaccurate anyway because Webmaster Tools doesn't know what Feedburner knows. But you OWN Feedburner- surely you can figure out how to bring this information together (possibly with our assistance and agreement, of course). Do it right or don't bother! I am glad you do this. I never have had this problem, and don't expect to, but it's good that you check. But for something this important, wouldn't it be better if you sent an email to an account I could specify? 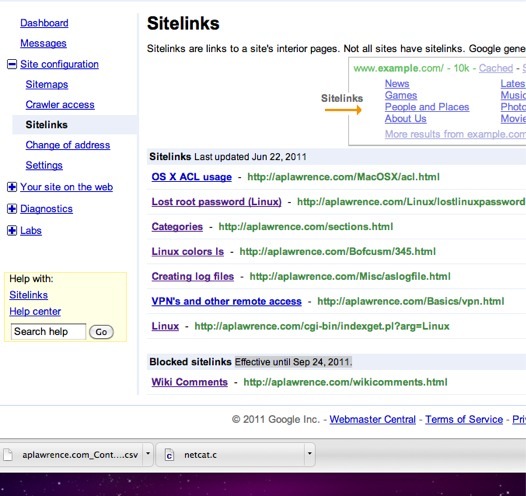 If this ever did happen to me, I'd want to know NOW, not whenever I happened to check in Webmaster Tools! Crawl errors are annoying for both of us and you know I want to fix them, Your lists are simply awful. Out of date, inaccurate.. do you EVER go back to retest these? Yes, I know you do, eventually, some day, on the twelfth of Never or whatever the schedule is, it takes too long. Ideally, you'd put a "recheck" button on each unfound link and let us clear these entries instantly. Failing that, is it really necessary to wait so long before removing the "errors" that have been fixed? I want to fix ALL of these types of errors quickly. You aren't helping me by leaving in things I have fixed. I suppose I'd care if it changed suddenly, but it never has. That has been useful. Thanks. As we can see in the picture below, you think "/Employment/communication.html" is a different page than "/Employment/communication.html?ref=foo". You've made the same error with many other pages. 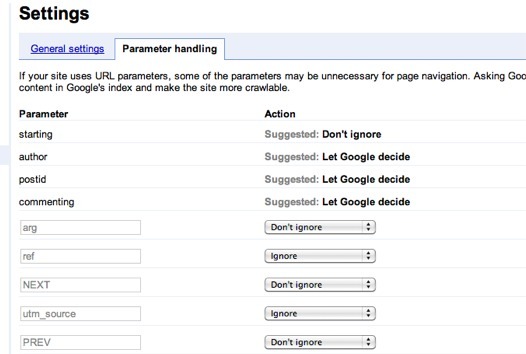 "If your site uses URL parameters, some of the parameters may be unnecessary for page navigation. Asking Google to ignore these parameters can reduce duplicate content in Google's index and make the site more crawlable." Yeah, sure it does. By the way, I bet dollars to donuts you do a hash of every page - that should help you realize that these are the exact same page! So you do not ignore stuff I tell you to ignore and you keep showing those links long after they have ceased to exist. Do you see why I get annoyed? Nor do you show "Date detected" here (you do in other sections), so it's hard for me to spot new entries. These have exactly the same issues as "Duplicate Meta descriptions" above. Same complaints: no dates, persistent entries, duplication from your not paying attention. This HAS to be wrong. You say my pages are "slower than 81% of sites". That simply can't be right unless you are grabbing some specific gigantic page. It would be nice if you told me what page that was. By the way, I did try out your Page Speed module.. It cut page load time by 1/10th of a second, 2/10ths at best. I disabled it because it also caused some other problems with Apache rewrites I need. Good idea, though. I'll give you a "B-". You can do better. Consistency needs improvements. Some parts show dates, some don't. Persistence is a big problem - if you can't really fix that, at least let us hide results we know are fixed. You can do better, Google. A little improvement here will help both of us.